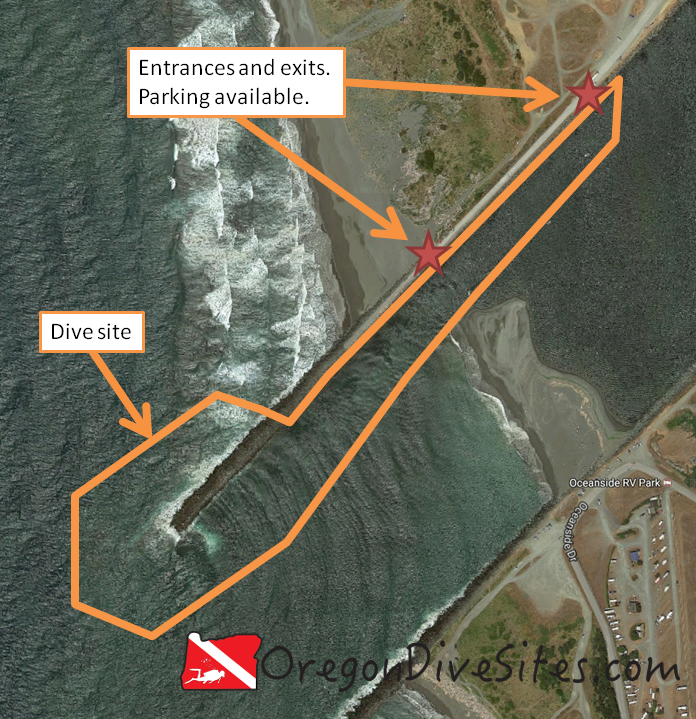 The Gold Beach north jetty is a shallow dive site that often has some surf and surge especially on the outer part of the dive site. SCUBA divers can expect to find good crabbing and spearfishing here. Another potentially interesting thing to do at this dive site is to search for gold nuggets. There is a reason that Gold Beach has its name. Back when white settlers first came to the area, gold was found in the black sand beaches around the mouth of the Rogue River. Most of it was long ago mined and carted off but there still is a little color now and then in the sand. The Gold Beach north jetty at the mouth of the Rogue River is a shallow dive site that often has surf and surge but there is good crabbing and spearfishing here. This Oregon SCUBA diving site is in the middle of Gold Beach, Oregon. Turn onto Wedderburn Loop from US101. You’ll see the jetty just to the south of the road. Follow the gravel road west along the jetty. There are many places to park along the Gold Beach north jetty. Choose your entrance and park near it. Be sure to not block the jetty road. The last time we checked, the parking was free. Verify though when you visit this dive site. The jetty runs southwest away from land. The inside of the jetty is usually much calmer than the outside but both the inside and outside can get rough sea conditions. You will see a big sand bar in the middle of the river mouth. This bar really makes conditions shallow at Gold Beach. Stick in the river channel along the north jetty for the deepest water you can find at this site. Don’t expect to be amazed with a really deep dive site. This is a very shallow place to go diving. You can clamber over the jetty wall anywhere along its length. In the map above, we marked a few good entrances and exits on the Gold Beach north jetty. You will almost certainly encounter current on the Gold Beach north jetty. SCUBA divers can expect to find some surf and surge as well, especially further west along the jetty. Depending on ocean and river conditions, you might get 5 feet of viz or up to 20 feet of viz. Plan on lower visibility and maybe you’ll get surprised with good viz. Water temperature is usually between 45 and 57F here. This site is diveable any time of the year assuming there isn’t a big storm in the ocean. You will be hard pressed to find more than 30 feet of water at high tide at the jetty tip at this site. If the US Army Corps of Engineers starts more aggressively dredging the Rogue River bar and channel, this site might get deeper but we wouldn’t count on that happening anytime soon. Open water divers with a few jetty dives under their belt can dive this site. We rate this as an intermediate site because of the current and the surf and surge conditions. Depending on where you park, you might have a 50 foot or a 500 foot walk. Park closer for less walking. No surface swim is needed at the Gold Beach north jetty. We’re not kidding when we say that the water isn’t very deep here and that there can be a lot of current. While the Rogue River bar might have been dredged to be deep and wide many years ago, nowadays the channel is narrow and shallow. You’re going to want a dive flag here because of the pleasure boat traffic. And be very careful as you surface that you don’t end up with a propeller blade through the top of your skull. Go south to Crescent City or go inland to Grants Pass or Medford for full service dive shops. Port Orford has an air fill station. There are a few decent restaurants in Gold Beach. Let us know if there is one you particularly love. We haven’t stayed in any of the hotels around Gold Beach but we can report that there are many campgrounds and primitive camping opportunities in the area.